A sold-out Rex Theater in Pittsburgh for PMJ tour opening night. Going on three years old, Postmodern Jukebox is not only (in my opinion) the most interesting thing happening in American music today – but they put on one of the best live music shows you will ever see. In case you’re not already familiar, the “postmodern” aspect is basic enough: They re-arrange modern pop songs into older styles. Shifting genres. Breaking frames. Meta versions of cover tunes. But that is an almost criminally bland simplification. First, to get the sense of what is so remarkable, get to know them a little: You can watch hours of their videos on the Web. 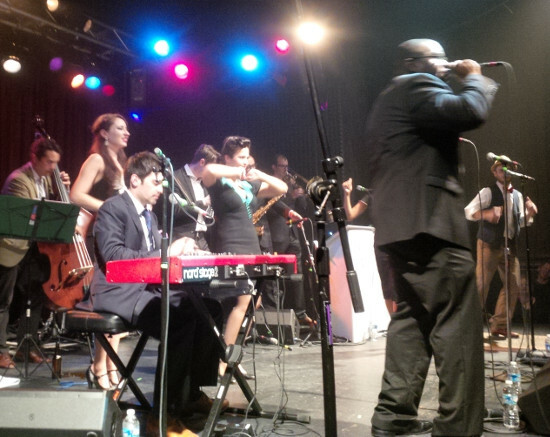 At Postmodern Jukebox’s center: wunderkind Scott Bradlee (click to read more about him). Wise, musically, WELL beyond his years: He’s in his early 30s, but knows 20th century music history like he was there from the beginning. Founder, architect, cornerstone, beating heart: Bradlee formed the group, devises the musical arrangements and writes the sheet music when needed for the other players. (The vocalists play a large role in developing, revising or transposing melodies from one version to another). He’s a shrewd videographer and pop music polymath overflowing with chops and creativity, and possessing a keen eye for talent. On top of that, by all accounts Scott Bradlee is a nice dude – one of the good guys, with true intelligence, doing something truly interesting. Someone you want to root for. Ashley Stroud, “triple threat” choreographer, singer and songwriter: lithe, enchanting, gorgeous song-and-dance performer extraordinaire with incredible vocal range. If not part of PMJ, she’d belong on Broadway. Christina Gatti, bona fide jazz singer with piercing eyes, a heart-rending delivery, and that je ne se quoi, from whom a roomful of people cannot avert their gaze: most likely to grab your attention and reduce you to tears. And main vocalist Robyn Adele Anderson whose rich voice floats in from another dimension … or era: a natural screen presence who has created some of the most amazing genre-busting performances. My vocabulary fails on this topic so just click here, ok?. She says she has “bitchy resting face” but I would say it’s a beguiling kind of beauty, and in any event you’re in impressive company. Why, that’s a “power face,” is what that is. As you will see from the videos, there are a few other very, very good vocalists who sing lead from time to time and, actually, an entire “family” of musicians have comprised the group from video to video. Alas, one can’t tell the whole PMJ story in a short article (to do that you’d need to write a book which, undoubtedly, is not far off), but if you watch some YouTube you can get the idea of the number of awesome people involved and how good they are. But here is an opinion/observation on why I think Postmodern Jukebox is so significant, and why you really ought to go see them perform while you can. Although there’s a “formula,” what they actually produce is anything but formulaic. Bluegrass, Motown, doo-wop, twist, swing and various flavors of jazz are a few of the “historical misappropriations” Bradlee uses to overlay and revamp modern pop songs, usually with fascinating results. Yet Bradlee often takes it to another meta-level entirely: For instance, turning Saturday cartoon themes into smoky jazz numbers, or a thin-sounding techno-pop hit into a magnificent, natural Tom Jones-style piece on a par with anything you might hear at the Kennedy Center. Albeit voiced by a seven-foot sad clown … but remember: META. On a similar note, in Pittsburgh on Friday, newcomer Von Smith’s tour de force number was his version, of Miche Braden’s PMJ cover of “Sweet Child O’Mine” – originally by Guns ‘N Roses, but reinvented as New Orleans jazz. Smith, with mind-blowing vocal range himself, came in at what sounded like one octave and two adrenaline levels higher than Braden, and basically riffed upward from there, evoking arched eyebrows and wide grins from the band. It brought down the house and, for those keeping track, counted as double-meta and double the fun. Post by Cassie Tai Tortorici. In each example above, you get a sense of the real genius at the root of Postmodern Jukebox: At first glance these seem like almost humorous exercises, but on closer examination the finished product is touching, beautiful, and even profound. This quality comes fully to the fore when the shift is not merely from one style to another, or from digital to analog – but from dirty, to something you could enjoy with your grandparents. The most glorious (and viral) of these are, visually, in large part the handiwork of Robyn Adele Anderson – she of the captivating expressions, reminiscent of pop culture circa 1954 – who transforms subject matter that is frankly squalid, to … cheeky, or almost naughty. Evoking better angels will always be in style. That is a special kind of gift, and one of several reasons I think Postmodern Jukebox will continue to step up to higher profiles, pop-culturally speaking. The move to LA was the next logical step. While Postmodern Jukebox may not change your life, if you are a music aficionado or take an interest in pop culture, broadly defined, you will very likely “get” the delightful aspect of the PMJ project. The audience in Pittsburgh on Friday, for instance, ranged from youngsters to hipsters to normal folks to middle-aged geeks like me – which in itself is an intriguing mix. The reaction or excitement level, though, was off the charts from one end of the hall to the other, across demographics and every other social category. Old and young, together in exuberance. 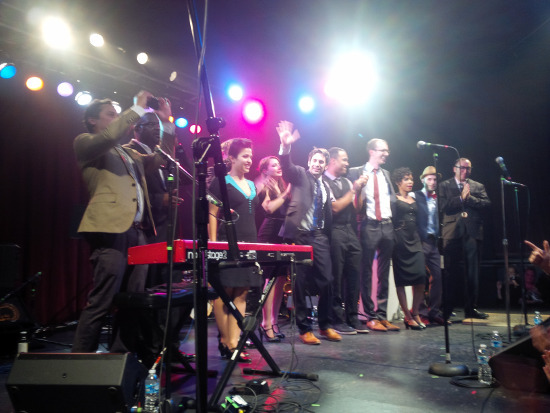 Thank you Pittsburgh: Postmodern Jukebox at conclusion of Friday’s concert. How does this happen? What is the magic? Part of it is: In addition to the sheer creativity and talent, PMJ’s reinventions are humanizing in a way that people from different backgrounds can appreciate. This is less a value judgement about musical tastes – about old music being “better” – than a statement of fact: about who we are, and how we experience joy as opposed to mere entertainment. When something forgettable becomes lovely, when something nasty is turned cheerful, we want to hold onto it. 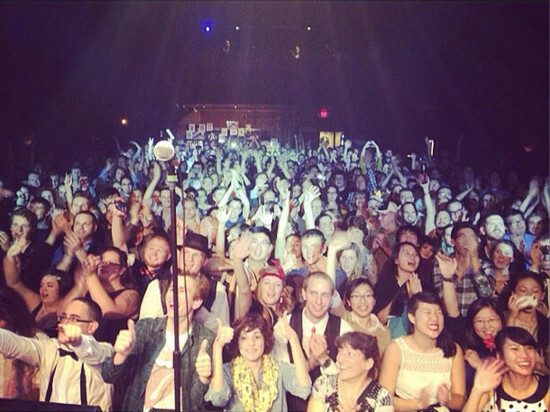 Breaking cultural frames is a team effort, because the music is theirs but the frames are ours. They bring us along, and lift us up. It’s not something you’ll experience very often. I thank you for your review. So disappointed that I was going out of town when the tour dates were announced. Thinking about a road trip to DC and your review may just put me behind the wheel. Thanks for reading, Kim, and I hope you get to see them in January. I tell you, whenever PMJ is within driving distance in the future we are probably going to be there.